But Tyson Foods may be changing. They recently bought a 5% stake in plant-based food company Beyond Meat. 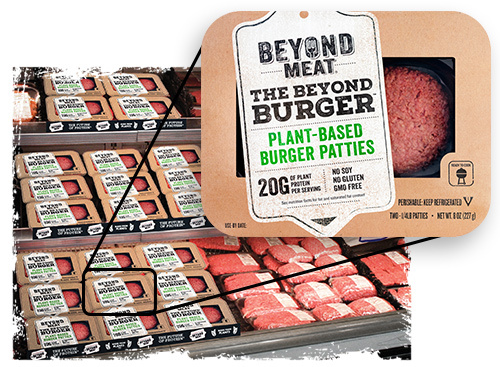 Beyond Meat makes the Beyond Burger, Beast Burger, Grilled Strips, Beefy Crumbles, and many other popular food products. In addition, Tom Hayes, the new CEO of Tyson Foods, recently stated that the future of animal agriculture is likely meatless. This is a startling statement that likely demonstrates his awareness that given consumer trends toward more environmentally sustainable, healthier, and humane food, and the recent competition by plant-based meat companies, the future of animal agriculture is at-risk. 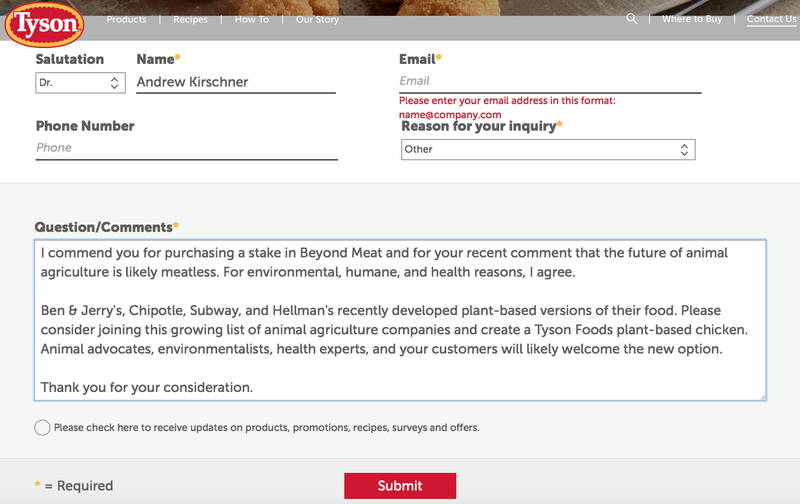 Please contact Tyson Foods and ask them to offer plant-based options. Think it’s unlikely? People used to feel the same way about Ben & Jerry’s, Hellman’s, and Subway. Now they offer plant-based options as a result of consumer demand. Done! Great idea… and thank you for all that you do! Thank you for taking action Igor! Thanks Andrew. Just sent a request to Tyson. I hope they get flooded with emails on this subject!!! Wonderful. I appreciate your advocacy Diane. Super. Thank you Nettie! Every suggestion counts! I sent Tyson an email. Thank you for bringing this to the attention of your readers. Thanks for your info, Andrew. I’m always glad to see a major company add new vegan products. Now going to the grocery store will be a better experience. I will be writing Tysons, but as with other big companies, like Silk, I am hesitant to buy their products. What makes Silk better than others is that they do not use GMO products in their milks. Hopefully, Tysons will be just as honest, and I’m hoping they are. Thank you Chris! Great attitude! Just remember though that the movement to convince companies like Tyson to develop a plant-based chicken, for example, isn’t about providing another option for us. It’s about providing another option for the billions of people who eat animals. I hope you will consider sending them a request. Thanks again!